There was also a huge dinner and company. Mostly Jewish company, because that’s what the oldest dearest friends who lived in New York happened to be. (The same people who showed up for our latke parties often made a second appearance on December 25th.) The center piece of the evening was the wonderfully diverse music my father played on the phonograph. Everything from Bach and Handel to Klezmer, to Louis Armstrong and Ella Fitzgerald. Even the scores from Jesus Christ Superstar and Fiddler on the Roof. Really. And for me, all of it went together because that was just our home and family. The year my father died, the eighth candle fell on Christmas Day. He had died in February at the age of seventy one and we were still too raw to imagine a Christmas without him. My mother and I decided there would be no tree that year; what we’d do instead was have a big, lavish Latke party and invite everyone we could, light the candles, make lots of food, play all Dad’s music, but not call it Christmas. It was the best possible way to spend the day. In my current family—meaning my husband (who is also Jewish, though secular) my two children and myself—we did not celebrate Christmas until my daughter was three and a half and my son was just walking. 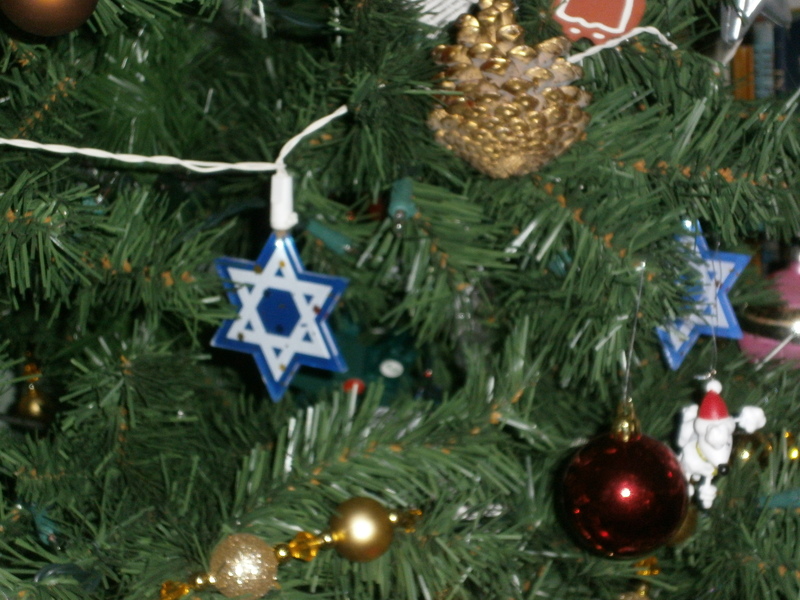 I thought I’d put Christmas to rest with my father and for my husband—frankly not celebrating Christmas was a big part of his Jewish identity. It was the children—and memories of sharing Christmas with my father that changed my mind. Yes, Christmas is everywhere this time of year. For all my friends raising Jewish children, it can be hard explaining why their families abstain from this huge part of American Culture. (I don’t say Christian culture; it is Christian, it is all Christian, but that’s not what our commercial society leads with. Whose image is more pervasive this time of year: Jesus or Santa?) But I didn’t succumb to pressure from my kids or anyone else. I chose to bring Christmas back into my life because I missed it; I missed my old family traditions. And because I was ready. My husband wasn’t hard to persuade, though he did resist at first. There’s nothing Christian about our Christmas, as there wasn’t when I was growing up. We have an artificial tree from Home Depot (with built in lights!) 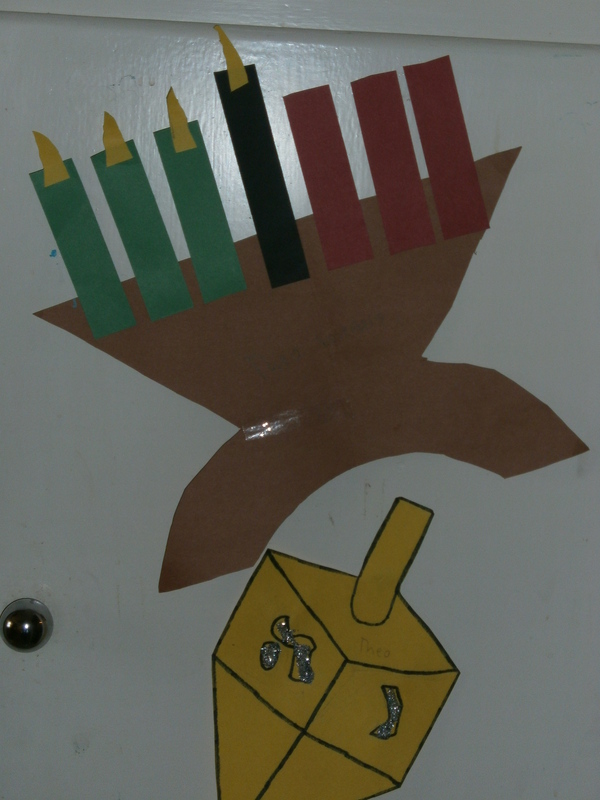 and we make Hanukah as important and special. Their Jewish identity is intact; when it’s time to make family holiday cards at school, they each come home with Hanukah cards—their own decisions. We give book gifts for each candle of Hanukah and exchange “stuff” gifts Christmas morning. And it works for us. Have a happy and a merry.